8" HMI screens offer a good compromise. Both their size and performance make them suitable for a wide range of applications, thanks to their great connectivity and mid-range specs. V808iC: +Ethernet and 12.5Mb of display Mem. 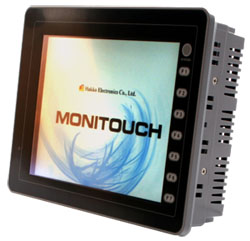 These 7" to 8" HMI screens offer a good compromise. Both their size and perfromance make them suitable for a wide range of applications, thanks to their great connectivity and mid-range specs.